About 7 years ago, my good friend told me about what happen to his boss. Then, my friend was working in a bank doing product control and his boss manages a team of six. One fine day, his boss got into an accident while on the road. His life was not in danger. However, he damaged his lower part of his body and they have to do a few operations to repair the hips. Then, the boss have to rehabilitate to get better. Unfortunately, the company couldn’t wait that long. And if you are in 2009 working in a bank, where they are always optimizing their capacity, the situation becomes more delicate. The company had to let the boss go. He have a very unique situation in that he couldn’t go out to find another job due to the rehabilitation plan. This account left a lasting impression then because I always thought a comprehensive insurance protection coverage involved a life insurance plan and critical illness plan. As long as you have both, you are well covered. Disability income is seldom talked about, but turns out, it attempts to cover this grey area, and protects an asset most dear and affects us in the most profound way. When you purchase an insurance for protection, you are hedging and transferring the risk of a negative event happening for a sum or stream of money, to offset the loss in the negative event. In this article, let me explain to you that, if you do not have disability income protection, you might want to consider covering this aspect of your wealth protection strategy. How does disability income work? What is your Most Important Asset that you Own at this moment? When I talked to young adults, who just started work, I realize most of them do not know what is their most important asset. They were often demoralized that they came out to work with debts and will immediately need to save up for marriage and then renovation for their house. All they have accumulated are debts, expenses. Not having any assets such as cash and savings do not give people confidence. However, the brighter ones would have deconstructed that they do own an asset which provides them a stream of cash flow. That asset is themselves, or their ability to work, to create business. Each of us would probably have 40 to 50 years of working capacity. Just because we do not see the asset now doesn’t mean we cannot value it. If your starting annual gross salary is $40,000 and our salary rise by 3%/yr over 40 years, the future value of your human capital is estimated to be $3,016,000! If you are more conscientious in your career and it grows at 5%, the future value of your human capital is $4,832,000. It is a sum of money that you might not be aware you will get in your pocket today, but logical that you will get somewhere in between. What could Adversely Impact this Asset? If you know that this amount of money is substantial, you want to be responsible with it. You will want to put away part of it. You will also want to protect it. It took you 15 years to academically build up competencies for you to build a lucrative career. But what if something happens along the way and derail your career? If your career is cut short by 20 years, your future value is $1,0740,000. If it is cut short by 25 years, your future value is $743,000. Your human capital loses a lot of value. With good health, you can earn money. With the earned money you can pay for expenses. Without good health, it will lead to not being able to pay for your expenses. What does Disability Income Insurance Protects you Against? Simply put, disability income replaces a percentage of your income, should you be unable to perform your occupation due to illnesses and disability. To be entitled to an admissible claim, you must be gainfully employed at the time of the injury or illness and your disability must be medically certified by a registered medical practitioner. Suppose the assured is gainfully employed in his profession where he is able to make use of his unique competency. Some of the insurers such as Aviva and GE are more strict, requiring that the assured is employed for more than 30 days. The assured earns $4000/mth and he is able to purchase up to 75% of his last drawn salary. The assured decides to cover $3000/mth. Suppose he suffered from vertigo which caused his head to be spinning, swaying in a particular direction. This is not critical enough to claim critical illness, yet it is problematic enough that he cannot function in his desk bound job that requires his analytical abilities. 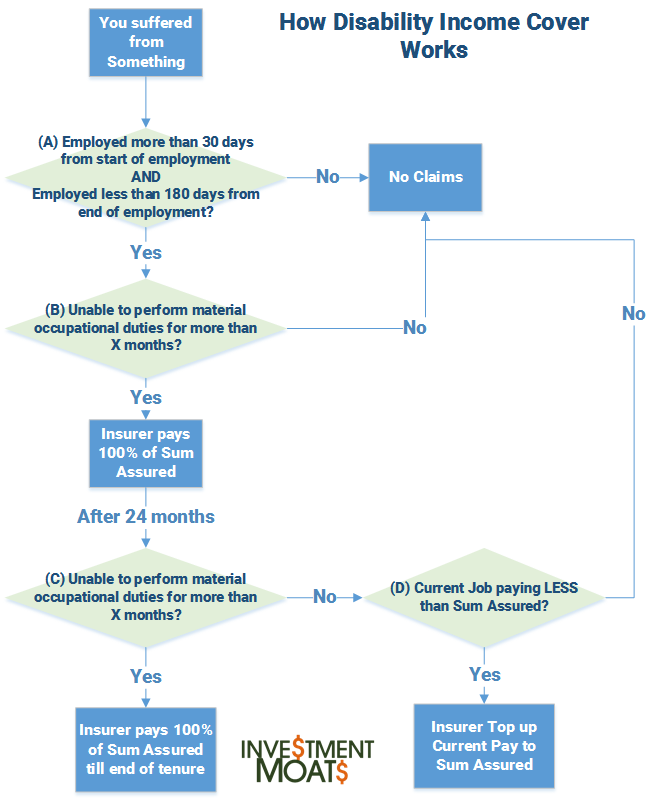 If the assured’s doctor is able to show that after X days, that he cannot perform in his occupation well (refer to decision B in the flow chart above), the assured will be paid a sum assured of $3000/mth. The insurer will re-evaluate in 2 years time whether the assured is able to perform the occupation (decision C). If the assured is still unable to, then the payout will continue till the maturity year (this will depend on your plan). The insurer will pay as long as you do not have an occupation. However, should the assured be employed in a job, where the salary is lower than the sum assured, the disability income policy will top up to the assured amount (in this example $3000/mth). Different insurers allows you to cover till different age but they should not be more than 65 years old, except for the MHA and SAF which is 70 years old. GE and Aviva provides the flexibility to cover to 55, 60, or 65 years old. SAF Group insurance do not have that flexibility, only covering to 70 years old. The longer the coverage the higher the premium. The payout does not start immediately. There is a waiting / deferred / pre-benefit period, depending on what the insurer calls it. For MHA & SAF Group insurance it is 6 months. AIA is about 2 months. GE have the flexibility of 2,3, 6 months. Aviva have the flexibility of 3 and 6 months. The longer the pre-benefit period, the lower the premium. Some of these disability income plan’s assured amount will increase at an annual rate. MHA and SAF Group insurance increase at a rate of 3%. Aviva’s IdealIncome allows you to specify whether the plan will have or do not have an escalation. Having escalation will of course be more expensive. The sum assured over the duration of the term can be very lucrative, and thus you will expect the insurers to be strict about who they let in on the plan. No guesses which one will have a more lasting impact. #2 will mean you think happily you are well covered, only for them to reject your claim when you most need it. The premiums will also differ for different categories of jobs, and the premiums are likely to differ for each category of jobs from insurer to insurer. If you change to a profession that falls within another occupation category, you would need to inform your insurer as the premium on coverage will change. The same thing has to be done if you get promoted, and wish to adjust your assured amount upwards. The caveat here is that I am afraid each evaluation is like an assessment of your health status again. The downside is that if your health does become worse, you might not be able to increase your sum assured amount. Due to how differently each insurer handles disability income, and that the coverage do change over time, don’t take my word as cast in stone. Check with a qualified adviser on the nuances of each plan and how much will be your premiums. I honestly think Disability Income, for the average folk is not overly expensive. For most insurers you have to get a quotation from a tied financial adviser or a independent financial adviser. 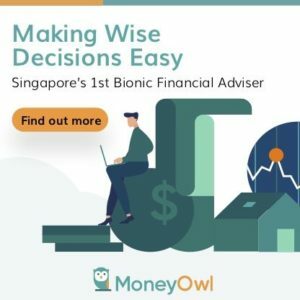 However, through DIYInsurance.com.sg, you are able to compare not just disability income, but also whole life, term life, critical illness, insurance endowments and find the cost effective insurance or savings plan that suits your needs. It is just that they only distribute one product for disability income, so there is nothing to compare! The annual cost for an assured amount of $711 for a $4000 coverage till age 65. That is about $60/mth or 1.2% of your monthly disposable income. If you bring down your coverage to $2000, the annual premium goes down to $385 or $32/mth. 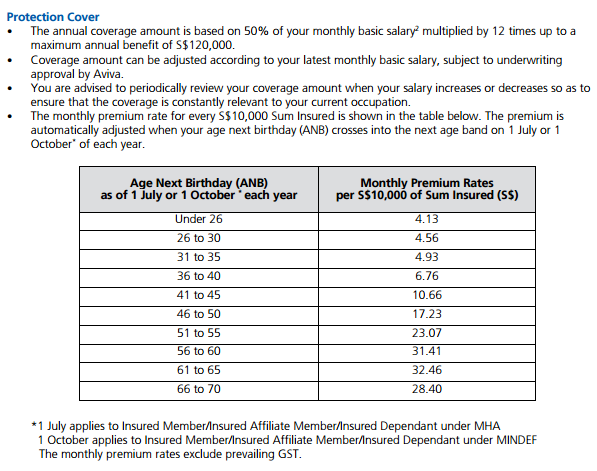 The above table show the premiums for the MHA & SAF Group Insurance. The premium is monthly for each $10,000 annual amount assured. So if you are assured $4000/mth, that is about $50,000/yr. At 30 years old your premium will be, $22.80/mth. That looks so much cheaper compared to IdealInome. However, do note the premium is increasing with age. At 61 years old, your monthly premium would have been $162/mth. IdealIncome’s premium is leveled. Compared to your whole life insurance and critical illness, I find the premiums to be manageable. Disability income, cannot be compared to other types of insurance because the risks the policy protect you against, is very different. It cannot be an apples to apples comparison. Having said that, hypothetically, if we only have a small sum of money and can only choose one type of insurance, how do the other types of insurance protection stack against disability income. The purpose of ranking these types of insurance on a protection ladder is to help you frame your mind to the impact of the negative event, and how the insurance protection can make your life much better. Life insurance, which protects against death and total permanent disability (TPD) is a much more common insurance that we buy. It is also the kind of insurance that we spend the most premiums on, as insurance agents earned a lot from the commissions of a cash value whole life insurance. However, if I assess the impact of life insurance versus disability income, I think disability income is more important. Firstly, the ones who need life insurance is not me but my dependents. This will be your spouse, children, parents. When the assured passed away, the dependents suffer, but I think in a lot of cases, the support that the dependents get from extended family may allow the dependents to tied over the loss of the income. The spouse could remarry. For older children, they might be able to struggle and survive on work and study. Not going to be pretty but, we have seen in history how much people made it in this case study. They say that in this costly world of ours, we can passed away but we cannot be sick. When you are sick, and you cannot work, you cannot cover your expenses. Your income goes down suddenly and you may rack up more expenses. Your income pays for everything. Your spouse have to be forced to work, and how is your spouse going to take care of you? If I were to push it, what is worth as much, and a headache to pay for, is your home mortgage. By default, your mortgage should be covered by a Decreasing Term Life Insurance. This one should rank higher than disability income. The probability that you will need to claim hospital and surgical insurance is higher than most other insurance. And the impact can be substantial, offsetting a large medical bill by paying a smaller amount. However, in Singapore, we have a minimal H&S insurance system in Medishield Life. Its not the most wonderful thing in the world, however it still provides basic H&S health care. Medishield Life can be paid by the CPF and not out of pocket as well. Late Stage Critical illness (CI) addresses the period where you are undergoing treatment for illnesses and complications that causes you to be critically ill.
CI policies cover the assured for 3 to 5 years of his annual income and a sum for alternative treatment. Critical Illness looks to pay a lump sum disability income amount. However, critical illness most often happens in advanced stage illness, where the person would have a lower probability of living past 5 years. I felt that Disability Income insurance is more necessary than CI because there are cases where illnesses are not so drastic that are near CI levels, yet you could faced a loss of income. The example of vertigo is a good one. An accident that causes you to lose finesse in your analytical ability or your limbs can be some other. It is not to the extend that you can claim CI, yet if you are paid very well and now you can only get a much lower paying job, your family’s life will be impacted. Many also have the misconception that CI is suppose to cover the major hospital bills. That is likely to be covered by health insurance. Due to that, the role of CI is more for alternative care and income replacement. The latter is a characteristic of disability income as well. The impact of a loss of income is larger than most personal accident situation. The assured may hold the probability of passing away or lost of functionality in certain areas. The probability of such an event and the payout can very well be covered by a disability income and a death life insurance. The comparison here is a comparison of the value of your human capital as an asset versus that of some of your tangible assets. Replacing the home in the event of a break in, fire would set you back perhaps $50,000. The same goes for a major accident and car repair. However, when you put them against the potential loss in future income, as we illustrated previously, the cost of loss in future income far outweigh that of these tangible costs. That is not to say car insurance is not important, it is mandatory. The objective here is for us to frame well the impact of protecting different assets. I got the first IdealLiving in 2007. Took me 3 years to get educated on that after coming out to work. After my salary increase, I try to declare some health situation as well. This made the adjustment of coverage to my IdealLiving problematic. More problematic was because its a lot of work for my independent insurance adviser, who I realize might not do a good job pushing things through. In 2014, I met up with the replacement of the first independent insurance adviser (she is actually the 2nd replacement!) and was advise on the AIA Premier cover. I thought its a good idea to attempt to increase the coverage, that is independent of the IdealLiving. The AIA policy was bought when I am older, and I gave as much declaration that I can. I was not excluded with anything. As Disability Income is rather stringent, do declare as much as you can so that, when you really need it, you don’t get a shock. If you are Financially Secure or Financially Independent, do you need Disability Insurance? Let us revisit why we pursue financial independence. We want to be financial independent so that we do not depend on our day job to support our family and our current lifestyle. 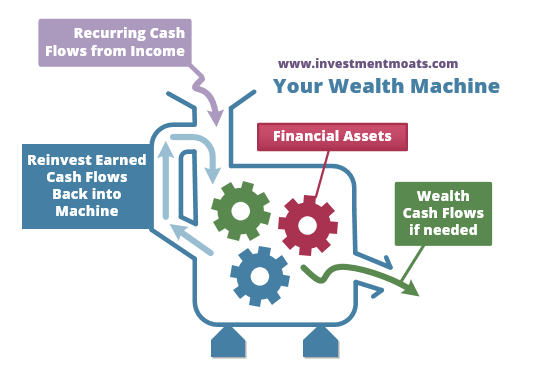 We are able to create Wealth Machines that generates Wealth Cash Flows if needed to support our family annual expenses. By achieving financial independence, we have detached the importance of having that income from work. In this case, you may choose to scale down your disability income. Unless you want to make a bet that you will suffer some accident, that you cannot work, and then this will accelerate your financial independence further! To be eligible for payout, you have to be in the occupation and not be out of work for 3 months, so if you choose to stop working, then your disability income for that occupation would have lapsed. In the case of financial security, the importance of disability income may be rather different. The difference between security and independence is that in financial security, we aim to cover our annual survival expenses, which are likely to be a small portion of your current lifestyle annual expenses. It is likely a family which have attained financial security, will work in some capacity, or reduced capacity. If a spouse loses their pay check, their Wealth Machines may be able to allow the family to pay for the survival expenses, however, there might be additional costs. I felt that disability income, in this case, have become less important, but is still rather integral in your family’s protection strategy. Why is Disability Income Not Popular? People confuse that when they are covered with Total Permanent Disability, they are covered: TPD is very different from disability income. When the cost to insure is almost the same as a death term life insurance, you know that the purpose is very different. Disability Income and TPD are very different. TPD has very stringent claim criteria. It requires one to lose any 2 of 6 limbs; namely eyes, hands (above wrist) and legs (above ankle) – or unable to perform 3 out of 6 Activities of Daily Living (feeding, dressing, toileting, washing, mobility and transferring). Disability Income insurance, however, has a more lenient form of disability definition. It is based on one’s occupation and easier to qualify than TPD. Disability Income Insurance in my opinion is rather unique. The experience and knowledgeable people I know see the importance of this form of insurance. The ones who are passive on insurance, tend to not see the point in getting something like this. Compared to a cash value protection plan, a disability income do not give you cash value. Thus, only those wiser folks understand the value of their own human capital. More so if they are an important breadwinner in their family. The challenge is that, we seldom encounter a story, a case study that tells us of a successful disability income claim. Perhaps it is difficult because in a large sample of Singapore, not many buys disability income and not many buys and eventually attempts to claim. When I look at the cost of disability income, I felt that even obtaining a minimal plan of $1000/mth to $2000/mth can be a massive boost if the worst case scenario happen. Finally, you should not purchase disability income alone, but see how it fits into your overall insurance strategy. For this, DIY Insurance have came up with a FREE Ebook explaining how all these different insurance come together as a holistic protection strategy. Do you have your own disability income case study? Do share with me if I am overselling or underselling this aspect of protection. This article is brought to you by DIY Insurance. Compare insurance protection, get a 30% rebate on insurance commission and empower your family and yourself. Make the right Protection Decision today! i didnt realise that DII actually covers up to 180days after end of employment. if this is solely based on the doctor diagnosis , is having a second opinion allowed? Hi FC, that i am not sure. perhaps we have to check with the advisers. I think your worry is that one mis diagnosis would any payout. Are you still in national service? Maybe Aviva SAF disability income is much cheaper. hi blancfable, i will be rod likely this year. SAF disability is much cheaper yes but sadly after i realize that after i purchase these private plan. SAF Disability is still a group insurance and may change in accordance to the group insurance mandate. In recognition of your contribution to national security, the Ministry of Defence (MINDEF) and Ministry of Home Affairs (MHA) have jointly come up with MINDEF & MHA Group Insurance to provide a new and comprehensive insurance that can give you and your family greater assurance and peace of mind. From 1 July 2016, MINDEF and MHA will provide you* with S$150,000 Group Term Life and S$150,000 Group Personal Accident insurance coverage during the terms of service. This coverage is under the Core Scheme and premiums are paid for by MINDEF and MHA. With this new announcement, my premium is dropped by half, even though coverage is the same. Furthermore, Aviva has been paying out a percentage of premiums rebate back to insurance holders when there are less claims. I find that this is sustainable due to this new collaboration and likely wont change. Can you pass me the number of the GE Agent friend . I would like to talk to him about Disability Income. thank you. i am interested to know if u are age 40 now and what u think about disability income vs eldershield? As i am reaching 40 next year. since eldershield will be activate once i am 40. is it still good to have a disability insurance or just eldershield is good enough? i can choose for something that can enhance the eldershield ( maybe Aviva my care or my care plus ) to have higher payout & cover for life time. Hi, may I have the number of your GE insurance friend? Am interested in signing up. Thank you.